After leaving Coeur d'Alene we enjoyed the scenic 4 hour drive up to Kootenay Lake to spend a few days with our friends. The Corvette got another fun workout with the winding mountain roads. Kootenay is one of the largest natural lakes in British Columbia, about 100 km in length and varying from 3 to 5 km in wide. The water is crystal clear and over 400' deep at some points. 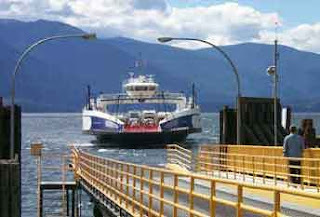 In 1947 the free auto ferry terminal moved from Gray Creek to Kootenay Bay and soon the highway, which was part of the Trans Canada Highway, was paved through to the ferry landing.With the new upgraded highway and with increased traffic along came cabins, restaurants and a gas station and garage. Today, Kootenay Bay continues to offer hospitality to the traveling public, and is home to about 100 people. After spending a few days in July visiting Dallas, TX and staying with our son in his new house in University Park and then with friends in their beautiful new house on Lake Ray Hubbard we continue with our Grand Tour of Spectacular Homes. 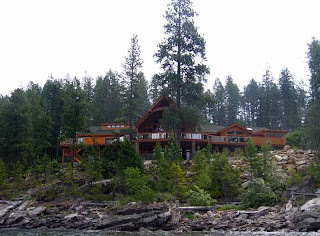 This luxurious log style house has a huge great room complete with a giant stone fireplace, bar, two sitting areas, a 70" flat screen TV, a projection TV and regulation pool table. 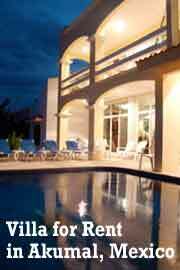 It has 5 bedrooms, 6 baths and a gourmet kitchen plus a full basement. Not bad for a lake house! And did I mention the view? Wow! Another couple joined us for dinner that night. Our hostess prepared Coquilles St. Jacques and followed up with a beef tenderloin. For dessert we had a homemade brownie with ice cream and fresh berries. We enjoyed a nightcap and headed to bed.